Hey Moms and Dads, I have been coming up with creative ways to make kids lunch healthy, fun and delicious and came across this easy trail mix recipe. It’s a great addition to any lunchbox like my Bento Box Turkey Club Roll-ups, which is also great in keeping each food group organized and separated. If you’re a parent like me you’re probably busy buying lunchboxes and backpacks to get the kids ready for school. My toddler is starting preschool this September, where did the summer go ! This is my first sponsored post, but a topic I can really relate to. With a toddler about to start preschool I couldn’t pass this up. When cooking for kids, my focus is always on healthy rather than skinny. When you involve your kids in the lunch-making process, chances are pretty good they will eat what they find in their lunchbox. My toddler loves the supermarket and I enjoy bringing her along. She helps me pick out the fruits and vegetables she likes and I make it a positive experience for both of us. 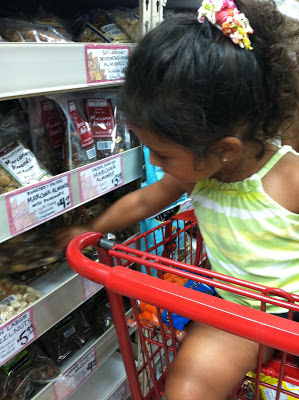 Pictured above she is helping me pick out the nuts and dried fruit to use in our trail mix recipe (recipe below). Get the Kids Involved in the Kitchen ! If they make it, they will eat it – let them help! I’m obsessed with sandwich cutters, aren’t they fun? They come in all sorts of fun shapes such as butterflies, hearts, dinosaurs, dolphins and more but you can even use cookie cutters and get the kids to help. And finally a recipe even the kids can make! 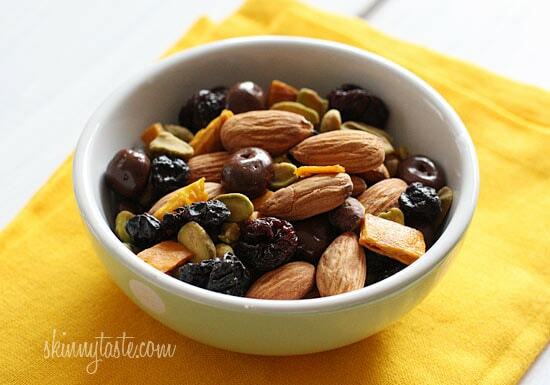 Instead of packing chips, make some trail mix. It’s a great snack for kids or adults which can be modified to suit anyone’s taste. Use whatever combination of dried fruit and nuts your kids enjoy and you can even add some granola, yogurt raisins, pretzels, cereal or chocolate to the mix. Thank you GLAD for bringing us this post. Learn how to make your kids’ summer daze into school days by clicking here to find Mom Made recipes and tips from GLAD. I would love to hear your tips, how do you make school lunch healthy and fun? Lot's of schools are nut free. 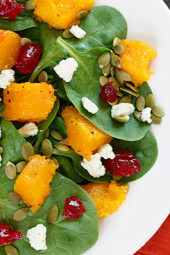 Substitute pumpkin and sunflower seeds for the almonds and pistachios….my kids love them! Love all the school lunch ideas and comments by the followers!!! My daughter goes to a nut-free school. Any ideas for a trail-mix without any nuts?! Replace the nuts with dried chick peas, edamame or soy beans if they like them. Or replace the nuts with sunflower seeds and pumpkin seeds. Just as yummy and yes allergy wise a seed is NOT a nut. Hi Gina These are all delicious recipes like always. With my son he is allergic to eggs, nuts and peanuts–even worchestershire sauce for legume(tamarind) related to peanuts. If you have ideas for breakfast and lunch please pass on. Thanks! Does he like oatmeal for breakfast? My kids love oatmeal shakes! Yes oatmeal once in awhile. Oatmeal shakes never tried? will google! thanks! Love all the cute cutout sandwiches Gina – I wouldn't mind having those myself! I've been searching the net about lunches since I'll have my first going into Kindergarten in a couple of weeks. I'm really concerned about putting meats and things in her lunch because of food safety. Here's a link to Columbus Parent – Kind of some good things to think about. You might have to copy and paste into your browser. I need to buy sandwich cutters! 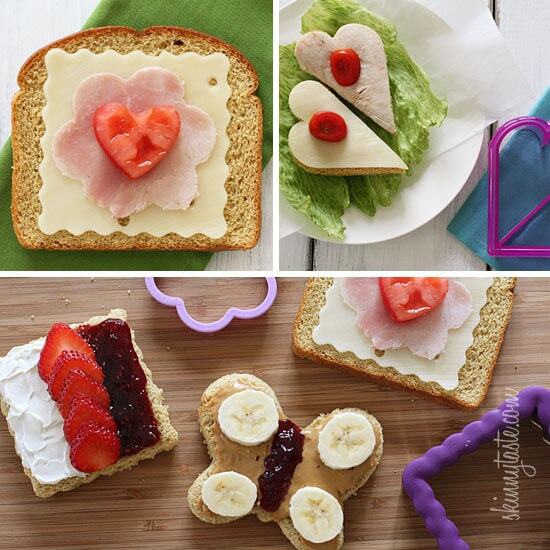 My soon to be kindergartener would LOVE shaped sandwiches! Hey Gina! First…I am OBSESSED with your website. I stalk you everyday & my heart skips a beat when I see a new recipe. No, I'm not a weird creeper…I just LOVE everything you make. I'm not a Mom so I don't cook for kids yet & I don't really need to lose weight, but I'm just trying to cook healthier for my hubs and I and your recipes are the greatest. So, please don't ever stop posting. Tonight's dinner: your chicken & mushrooms in white wine sauce & zucchini tots. Can't wait. THANK YOU! I love it! My pleasure! My mom used to have a contraption that used to press a design into bread. Then when you toast the bread, the design shows up. It was a fun thing to find in your lunchbox. 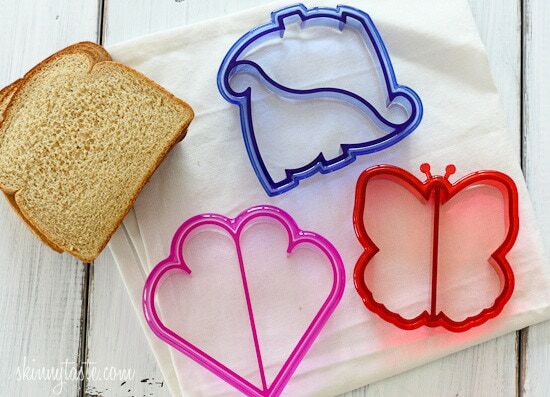 OMG how ADORABLE are those sandwich cutters?? I have never seen them before! I will definitely have to track some of those down for my parents to use for my little sister (age 7). She will love it! Thanks! I can't wait until I can pack a lunch for Caleb:) Love the trail mix! Somebody questioned the crusts… Another blog I follow posted how she saves all the leftover bread scraps from her bento style lunches in the freezer in a gallon bag. Once full she makes a special weekend breakfast of French Toast Bake! Love that idea! We usually feed the birds with the scraps. Or you can make breadcrumbs. you can also make stuffing or croutons with the crusts. I agree with the others about the thermos ideas. I have 2 boys, 1 in 4th grade and 1 in kindergarten and they are both so plain and picky. So it's a struggle finding variety for them. We tried cheese ravioli and light Alfredo sauce in the thermos-alternative to Mac n cheese. I like sandwich cutter ideas. We have also used those mini Sara lee buns for sandwich bread. Also homemade lunchables, crackers, cheese, pepperoni or ham. I give them a banana cut in half in peel. Grapes, sliced strawberries, carrots, applesauce. Snacks-whole grain chips and crackers, cheese popcorn, teddy Graham's, animal crackers. It's not a nut free school yet, but they ask we not send peanuts. They love peanut butter. I need an alternative. Anyway I agree, lunch box or just lunch ideas are always needed. Thanks! My teen loved bringing hot lunches. I used to pack chicken noodle soup or pasta (whatever leftovers we had) in her thermos. Sunbutter- made from sunflower seeds could be an alternative to peanut butter. and nutella- though ask the school first. Not sure if hazelnuts is a big cross-reactor for those with peanut allergies. I second the sunbutter. It's wonderful! This post comes JUST In time as my I have been planning on doing this for my two youngest as I have to make their lunch & my little girl is going to start Kindergarten and think this will be a wonderful way to send a little bit of extra love w/them (last yr. I just did notes ha) Thank you SO much for this post! I used to do notes too, my daughter loved it! How could any child not be the envy and have the coolest lunch of their whole lunch table, and all of the other children not want to eat healthy too??? Love this!!! That sandwich looks so pretty and yummy, I bet that your kids loved it so much! Your sandwiches are just too cute with the cutters! Well we homeschool, so I don't really pack the kids lunches. But I get burned out too trying to figure out what to make for lunch. So I will use these ideas myself!! Thanks for sharing. Takes a bit of work but I like to print pictures out of a few things we need from our list and let my son find them for me. Thank you for including this list of lunch and snack ideas for the kiddos. Bravo to you for suggesting these tips to parents. Making good food fun is the way we start getting good nutrition into our kids. I love the different foods cut into shapes. Who wouldn't want to eat that? What keeps me from using the sandwich cutters is the wasted stuff cut off. But I know my kids (and husband) would love it. That's when you use the extra bread for homemade croutons! Or if it were me, I'd eat the cut off parts as my lunch. my son (5yrs) has always eaten the crust of his sandwich/toast. For his 1st day of kindergarten (last Wednesday) I made him a sandwich using a gingerbread man cutter (without decoration, it's just a person), and then put the extra bits under the cutout. But, he's also used to eating the extras since we've just always done it that way & he doesn't know any different. find anything thats healthy haha. . Any suggestions? Long before I heard of "Trail Mix", my mother used to put a combination of walnut halves and raisins together for our school lunches. That was a great treat and to this day, comfort food. Love the idea of chocolate covered raisins in the mix. If I buy chocolate covered raisins they usually disappear in a day or two!! So now I'll put them right into some trail mix and at least it'll be healthier than just eating the choc. raisins. 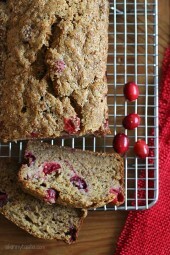 Around our house I always keep almonds,walnuts, semi-sweet chocolate chips, raisins, and dried cranberries for baking. So my kids (in their 20's) put a little of each into a small container and take as snacks to work and school. So easy with supplies already on hand. Thanks all your wonderful ideas! What a great post! I always loved making special lunches for my girls. 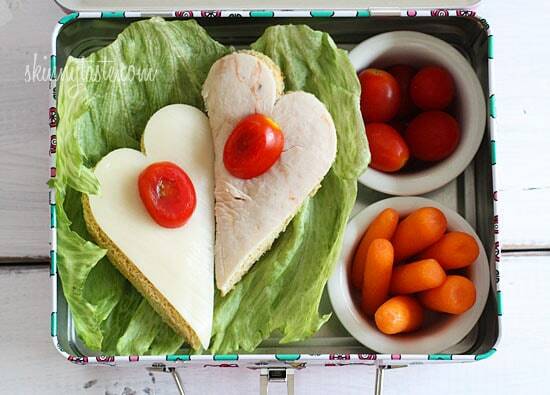 Your daughter will love her lunches! I'm not a mom, but my boyfriend certainly acts like a kid when it comes to food (so do I). Grown up lunches have to be fun and healthy too. Instead of making sandwiches and snacks, my grown-up taste buds crave something just a little more refined. Just last night, I made oven-fried chicken using a recipe I adapted from delish.com. I can't say if it's good or not, but it left the house smelling great and my boyfriend kept saying he was going to eat his lunch last night. I also made a "succotash" (I don't know what else to call it) using some produce I get from a delivery service. I used baby eggplants, a variety of peppers and fresh lima beans. I did take a taste of that, and I was quite pleased. It will be a very good lunch. I've seen them in Wal Mart, and I think Bed bath and beyond. They have so many on Amazon.com, that's where I buy them. Great post. Thanks for all of the ideas. I love the watermelon butterflies and the banana flowers! LOL! I think my husband may enjoy this too! He's never taken a lunch to work, but he's about to start night school and won't have time to stop at home to eat dinner nor stop between work and school to eat (thank goodness! That would get expensive!). I will use some of these to help keep him happy twice a week with a "lunch-style" dinner! 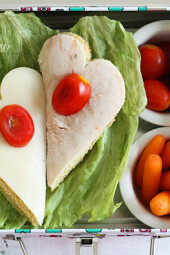 My 19 year old told me she still wants heart shaped sandwiches! Great tips! I was reading my Self magazine this morning and saw that you won for health and fitness blogs. Very cool! Congrats! I make homemade lunches for the kids but my big question is how do you keep things like the apples, banannas from going brown by lunch time? Do you put lemon juice on them? I've put lemon and orange juice on cut up apples to try and keep them from going brown but my children don't like that they can taste it. now that they are bigger and can eat a whole apple I cut it into wedges, take out the core and then form it back into an apple shape and quickly place it in a fold top sandwich bag to keep all the air out and to keep the cut part of the apple unexposed for as long as possible, that seems to work pretty well. You can also slice the apple, put it back into "apple" shape and put a rubber band around it to keep it together. That will keep it from going brown. I never slice bananas for my kiddo's lunch. He can peel a banana easily enough, but apples can get messy if they are very juicy. My kids also disliked the lemon juice flavor, but you can also use any lemon lime flavored soda. It obviously adds a little sugar – but it works very well! 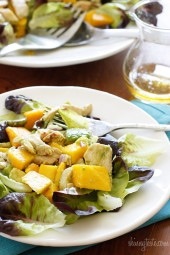 When I worked in a salad bar's kitchen, we would dip the cut apples in pineapple juice. They wouldn't get all brown as quickly, and the taste wasn't as objectionable as pure lemon juice. Instead of using straight lemon juice, I fill a bowl with water and add a tablespoon or so of lemon juice, then soak the apple slices in the water for a minute or two. This prevents browning, and the lemon taste is barely there. I've also heard of people sprinkling the apple slices with cinnamon. That doesn't prevent browning, but hides it, and adds a little flavor. I use the lemon lime soda idea but use sugar free (sprite, 7up, or even giner ale). It does work really well. These are great tips; I'll have to remember them for when i have children of my own. Love your ideas. I have four kids and three will be in school next year. One is a Type I diabetic so it's even more of a challenge to carb-count everything and keep it right in range for him. The problem we have now is that our district is completely nut free so it is extremely limiting (particularly as nuts and nut butters are a great high-protein, lower-carb snack option for my five year old). Any new ideas here are more than welcome, thanks! I too have a T1 diabetic child, so I understand what you mean about making lunches with a good carb count. My daughter cannot take anything with peanuts so PB is out. We have found that sunbutter is a good substitute. It is made from sunflower seeds and you can buy it next to PB. She doesn't notice the difference. I am allergic to peanuts and I just loooove Almond Butter. Look for a brand that does not add salt. Trader Joe's is my favorite. My oldest is going into 3rd grade. she's currently IN LOVE with our homemade tomato bisque. I get a stainless steel thermos, and fill it w/ really hot water while I heat up the soup. once the soup is hot, I dump the water, dry out the thermos and put the soup in. It will stay much hotter longer if you pre-heat the thermos. Works well with mac and cheese, spaghetti, and taco/sloppy joe meat that she scoops out w/baked pita or tortillas. I also send in homemade pudding snacks on occassion, as well as pretzels sticks and cheese logs(string cheese to everyone outside our family!) so she can make cheese bugs. and some gorp- peantus/cashews/sunflower seeds w/craisins, raisins and some m and m's thrown is is another favorite. I freeze a stonyfield organic yogurt tube and use that in addition to another ice pack to keep things cold. wonderful ideas. i may use some of these this year for my fourth gradeer. 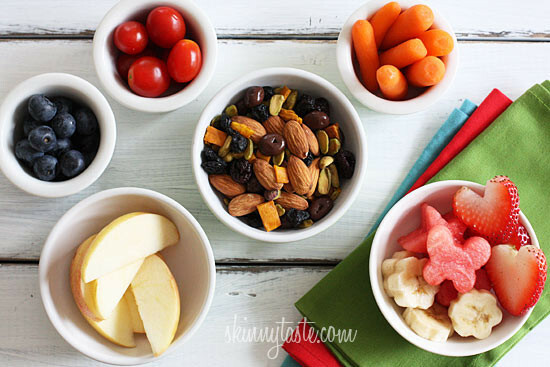 Can't do the trail mix as his school is totally peanut free but a great snack for home. I have been thinking of ideas for lunches for the upcoming school year. I have four kids and feel like an assembly-line while making them the night before. I know that they tend to get bored by mid year with the typical fare and I really can't cater to each kid–they all take the same lunch. I'll try to keep some of your ideas in mind to spice things up. Thanks! *Oh, I agree with keeping their meals healthy but not "light" as they are thin and active. I love your sandwhich examples, but do you have any suggestions to keep them from getting smooshed in the lunch box? Especially the open face ones! They have sandwich containers which are perfect for open faced sandwiches, I usually close my sandwiches but for photo purposes I left them open so you can see what's inside. Thank you for such a wonderful blog!!! I love coconut in my trail mix! I think making cutout sandwiches for your mom is the sweetest thing I have heard in a long time. What a lovely thing to do! I agree – was just thinking the same thing. What a sweet and simple way to brighten her day. Aww… Marianne. Your mother raised a beautiful daughter. You are so lucky to have each other. That's the sweetest thing I've heard all day. Add pumpkin seeds. They have protein. Marianne, your post made me smile. What a wonderful thing to do! Marianne, that is so sweet. I wish my mom was still here so I could do the same for her!